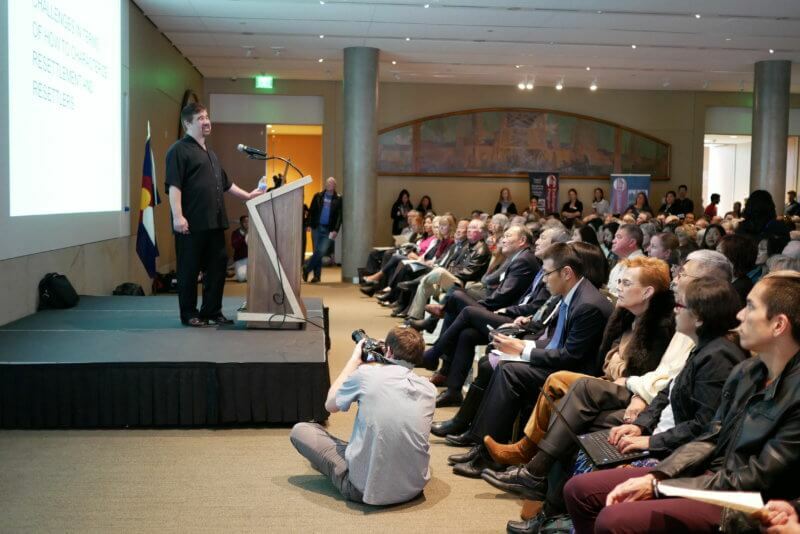 A standing-room-only crowd attended this year’s Japanese American Day of Remembrance in Denver. Lane Hirabayashi, Asian American studies expert and author of books about Japanese American history, gave a presentation of the post-war resettlement of JAs in Denver. 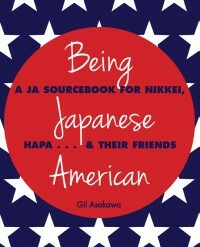 Many Japanese Americans I know don’t pay much attention to Japan, which I think is a pity. I believe JAs should keep up with news from Japan, and travel to Japan. A lot. However, most JAs I know closely follow the news of Donald Trump’s presidency, and what he’s doing in the US. JAs – and others — have been concerned enough about our president that this year’s Day of Remembrance events across the US, which commemorated the 75th anniversary of the signing of Executive Order 9066 on Feb. 19, 1942 by President Franklin Roosevelt, were packed with much larger audiences than in past years. That’s because EO 9066 led to the incarceration of 120,000 people of Japanese descent in American concentration camps. Now, with President Donald Trump signing a blizzard of executive orders including two controversial, currently on-hold one temporarily banning travel to the US from seven Muslim-majority countries, and threatening to punish “sanctuary cities,” also blocked by a federal judge, Executive Order 9066 has a much heavier symbolic weight. People are worried that what happened to Japanese Americans could happen again to Muslim Americans. A ban and registry, which were both cited during Trump’s campaign, are first steps to what happened to JAs 75 years ago. So Trump’s brief reign as president has already resulted in a lot more awareness of the Japanese American experience. Thanks, prez! But JAs should also keep an eye on what he does and how he thinks about Asia, and in particular, Japan. Like a grade school bully rampaging through a candy store, Trump has gleefully overturned a lot of his predecessor’s accomplishments as if they were baskets of penny candy that are easy to knock over. Or at least, he’s trying to. Whether he succeeds or not, he’s leaving a mess in his wake that will have to be cleaned up, by his aides if not by the next administration (which can’t come too soon). His grasp of foreign relations is by all accounts his weakest point. By intoning “America First” as the tagline for his campaign and now administration, Trump is purposefully turning his back on the rest of the world. That’s unfortunate, since for the past couple of decades the world including the United States has come to terms with the fact that we are all interconnected, that the globe is a much smaller place than a generation ago, and that both culture and business is these days connected by the inexorable web of technology and communication. Trump alarmed anyone with an interest in Japan, for instance, by suggesting during the campaign that Japan and South Korea might be better off developing their own nuclear weapons – a suggestion that’s anathema to Japanese. He repeatedly growled about how Japan wasn’t paying its share of the US military’s presence in the country. He repeatedly criticized the Trans Pacific Partnership, or TPP, as a terrible trade pact. His vision of America First is so short-sighted he wants to focus solely on companies manufacturing in the United States, and he wants to tax any companies, foreign or domestic, that manufactures anything outside of the US and imports it here. This opposition to the TPP has already manifested itself – although to be fair, Hillary Clinton also said she’d veto it if she became president – and Trump has backed out of the deal. He’s accused Japan (and China, many times) of manipulating its currency, and it’s not clear to some media commentators whether he understands how currency works across the globe. Japanese government and corporate leaders made pronouncements reminding the Trump administration how much Japan has invested in US manufacturing and American jobs, and how much Japan has paid over the decades to house American military, especially in Okinawa – often in the face of fierce opposition and protests from Japanese. Trump spent a couple of weeks holding some reportedly unfortunate phone calls with world leaders, showing his ignorance and showing off his childish view of world affairs by insulting some of our closest allies (Australia) and yet cozying up to one of our oldest foes (Russia). He symbolically embraced Taiwan independence by having a friendly phone call with the country’s leader, then later seemed to back down and cow in front of China’s president Xi Jinping and reaffirm the “One China Policy” that has been part of US foreign policy for decades. Since then, he met in person with Xi, and declared that China isn’t manipulating its currency after all. He has put a lot of faith into China’s ability to keep North Korea’s Kim Jong-un from doing anything rash. Trump admitted that after speaking with Xi for “10 minures” he now realizes that the relationship between China and the Korean peninsula aren’t so simple. But that hasn’t stopped him from talking as if China can control North Korea. Or else, he threatened, he’ll act unilaterally with American military might. Yikes. Imagine how this trash-talk is going over in both Japan and South Korea, which would be Kim’s first targets if war breaks out. Trump’s unpredictable mood and policy swings has forced other world leaders to either distance themselves and watch until he settles down, or, in the case of Japan’s Prime Minister Shinzo Abe, openly engage with the rookie President even though he had disparaged Japan in his rhetoric. In fact Abe was brave enough to be the first foreign leader to visit Trump after he was elected, even before he was sworn in. During that controversial visit at Trump Tower, the president-elect’s daughter Ivanka sat in on the talks between the world leaders, causing some questions about the conflict of interest of selling her clothing line in Japan. Abe returned to America to visit Trump after his inauguration, spending a weekend with the president and being involved in more unexpected controversy. First, Melania Trump was in New the family’s New York City home and Abe’s wife Akie had to tour the sights of D.C. without being guided by the First Lady. Maybe the Trumps didn’t think it was big deal, but I suspect in Japan this was not cool. The Abes were joined by Melania when they went to Florida to spend the weekend at Trump’s “Winter White House,” Mar-a-Lago, and Abe got to golf with Trump. But during a posh dinner at Mar-a-Lago, the news came in that North Korea had fired a test missile that landed in the Sea of Japan. Instead of moving into a private room to discuss the potential world crisis, Trump kept the dinner party at his club’s restaurant, allowing gawking club members (whose dues to just join the club were doubled from $100,000 to $200,000 when Trump won the presidency) to look on, peer at national security intelligence photos and briefings, and shoot selfies with the soldier who carries the “football,” the code to the nuclear trigger. Donald Trump has turned the most important job in the world into a reality television show. Abe’s outreach to Trump, and the nudge from Kim Jong-un’s missile threat, seems to have helped seal the cracking relationship between our two countries. Trump has affirmed the close relationship with Japan and has pledged to protect Japan, as has been the case since the end of World War II. He still isn’t inclined to sign on to the TPP (leaving China to become the dominant economic force in Asia) but the US is negotiating on trade deals directly with Japan. We’ll see if products from Japan end up more expensive because if tariffs charged to import them in the US. If consumers shun these products – like food, toys, machines and cars – the ripple effects will be felt not just in the US economy but around the world. It remains to be seen how this closest of relationships between the US and Japan evolves during the Trump presidency. But we should all be watching closely, because if it doesn’t affect us personally (and probably will, in our wallets), it might affect our relatives across the Pacific. Tagged day of remembrance, japan, muslims, trump. Bookmark the permalink.